You know that feeling when you’ve been communicating with an online friend for years and then you finally get to meet them in real life? That’s kind of how I felt about Lands’ End when I went to their store launch event at the Staten Island Mall. I remember exactly when I discovered Lands’ End. It was pre-kids when I decided to buy a floor length puffer jacket because I was fed up with the bone chilling cold weather. We walk everywhere in Manhattan so a warm coat is crucial to our wellbeing. I bet there are tons of people who end up moving to the burbs just because they never had the right jacket. All the floor length puffers I had seen in store were a little snug in the waist and made me look like I had an odd shape. Someone suggested Lands’ End because there floor length puffers looked quite literally like you were wearing a sleeping bag. “That’s perfect!” I thought. My next Lands’ End purchase was when Mike suggested them for the kids’ winter coats. They made reasonably priced puffer jackets for kids in all different colors too. We bought the girls the thin puffers which are great because you can fold them up easily in a bag and they work in both cold and not-so-cold weather. Then we realized that Lands’ End also made great swimsuits for kids and they became our go-to online shop for the summer too. Buying swimsuits led to other clothing purchases for the kids. And then last spring when I was buying Lands’ End swimsuits for the kids before our spring break trip to Mexico, I realized I really needed a new swimsuit too. I never have the time or inclination to shop for myself, but tacking on to the kids’ purchase seemed much more doable. I clicked “women’s swimsuits” and found out that Lands’ End has a huge selection with some pretty flattering one pieces for curvier bodies too. I found a purple one-piece and made my first ever online swimsuit purchase. I was a little nervous when it got there because I had no time to get something else if it didn’t fit, but I kid you not— this thing fit PERFECTLY. It was supportive and slimming and covered all the things I don’t like to show in public. I wore it all summer. But none of this is really what I am here to tell you about. 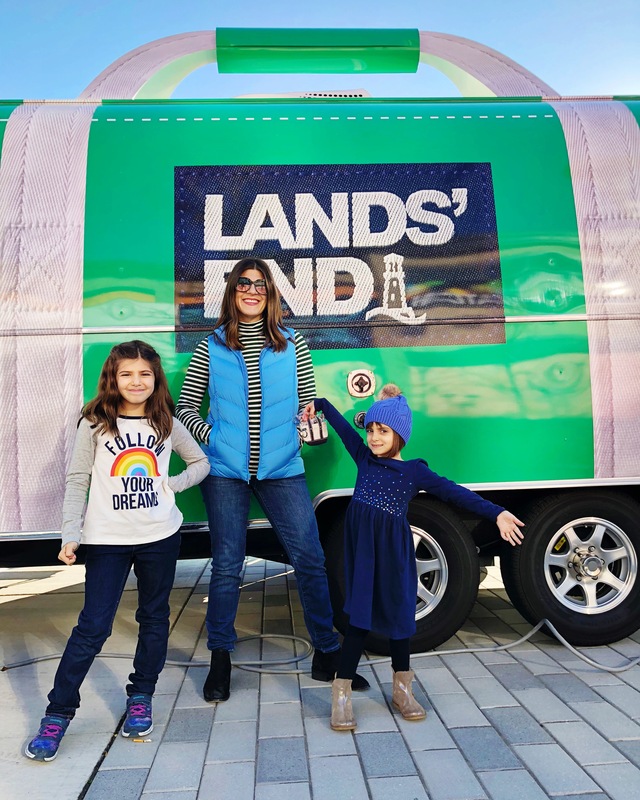 I am here to tell you about the fact that Lands’ End, one of my favorite online shops, has begun to open a bunch of real life stores. I took the family to their store opening in Staten Island Mall and there is another one opening in the Paramus Mall on November 10th. It was interesting seeing the store because it gave me a much more complete picture of what the Lands’ End brand is all about. It’s super colorful, very practical and all about the classics. Everything in there is super fun, reasonably priced, high quality and seems like it will never go out of style. It was also fun because for the opening, they had an airstream set up outside as a dressing room with some of their more colorful sweaters and jackets on outdoor racks. We were given a shopping spree to buy some winter items for the whole family. I bought a white puffer vest, a blue puffer vest, some cotton turtlenecks and jeans with an elastic waistband just like my kids wear. Mike bought a plaid button down, some sweaters, khakis, a puffer jacket, and boots. Harlow bought some cotton dresses, tights, winter boots, a hat and pajamas. Mazzy bought some cotton shirts, jeans, and winter boots. Then Mazzy and Harlow had a fight over who could buy a big silver star patterned navy puffer coat with a faux fur hood. Mazzy did NOT want them to get the same jacket. I finally settled things by showing Mazzy a thin puffer jacket in her favorite color— turquoise. Harlow’s size wasn’t available in store but we were able to order it from an online kiosk in the store. That’s the other great thing about the Lands’ End in-store experience. They make it super easy to order what isn’t in stock on your own without having to get a salesperson’s help. It also allowed me to try on a bunch of items and learn my sizing so that the next time I buy a sweater or a pair of jeans on the site, I’ll know exactly what to get. I think elastic waisted jeans might be the new black. This post was sponsored by Lands’ End, but my devotion to my sleeping bag puffer coat is completely my own. milwaukee has had 2 land’s end retail stores for as long as i can remember, and i have never gone in! You may have changed my mind…. My family has long loved Land’s End. My sister has a long puffer coat (it was mine and I stupidly gave it up in my early 20s when I thought I was too cook 😟). She calls her the down comforter with sleeves! Inna, I agree. I live in Madison, WI, and we have had a Land’s End store forever (we are only 30 miles or so from Dodgeville, their headquarters). I have always loved Land’s End. I love Lands End! Great classic clothing, high quality for a decent price (they can have some great sales sometimes) and I agree, their swimsuit selection is amazing. I wish they had more stores in California – hopefully they’ll open up more stores soon. We LOVE Land’s End! I have four kids and not much has survived all four (equipment, clothes, …my waistline). My sister gave me a hand-me-down sleeper from Land’s End that three of her babies wore, and now my fourth is wearing it. That’s serious quality!